The San Francisco Chronicle’s Leah Garchick mentioned me today. Well, she actually mentioned filmmaker Tiffany Shlain giving a nod to my APPL=JEWS/MSFT=XIANS piece which is one of the pieces I’m proudest of and, ironically enough, for sale on iTunes. It’s also my first piece to get me called Anti-Semitic and racits (though apparently not the last if you read my recent post on Jews and East Indians). My pal Tony tipped me about a recent NYT article entitled In Jews, Indian-Americans See a Role Model in Activism. The article talks about Jewish influence in modelling community centres like the one where I developed my talk show, but then careens into politics and foreign policy. It says a lot about the New York Times, the author, perhaps the “mainstream” Jewish and East Indian American communities and certainly American culture and politics that the analysis of what brings people together and creates their advocacy is what they’re afraid of. Forget external enemies. Jews and East Indian Americans are natural allies because of their neurotic, anxious parents. A subverted travelogue of our adventures in France, Spain and America which turns out to be a pretty wonderful place. Last night at the dinner before the talk show, my guest Merlin casually dropped “pack of fives” into conversation. As in, “If that guy gives you any trouble, give him a pack of fives.” You say this while raising a fist to illustrate. This let to a bunch of fun reminiscing about my grandpa Sam and the stuff he would say. One of his favourite ways to show affection was to say “I’m gonna give you a punch in the nose McGee.” We were all McGee at different times. Also MacDuff. He also liked to call his grandchildren Butch or Butchie from the time we were infants (I was the only one for which this name was the least bit accurate). Trumpanick and Muzzik were also common terms for us, though these are Yiddish words and really Old Timey in a different way, meaning “troublemaker.” He emigrated/was smuggled out from the shtetl to Canada when he was 5 years old. I miss my grandpa, but everytime I hear his words I feel like he’s here. What’s your grandparent’s Old Timey slang? 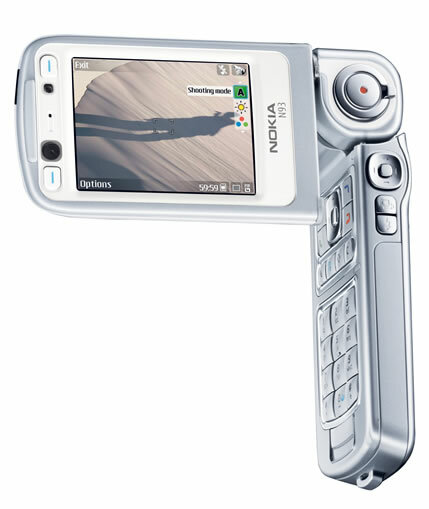 Nokia N93 slakes some of my iPhone thirst and Apple fervor. Stowe Boyd kindly loaned me a Nokia 93 cell phone which is pretty tricked out, most notably with a very high quality video camera.I plan to use this to vlog at the Supernova Conference in a few weeks (with the goal of making a tech/biz conference highly entertaining and insightful) and in general. This is my first Bluetooth, infrared device and i am very thrilled to say that I was able to sync all my contacts and calendar very easily with Apple’s iSync. Before a few moments ago, I was under the Applr-y impression that I’d need an iPhone to get that. The thing about loving Apple is, like many Jews with Israel, we need it to exist, celebrate its excellence and want it so much that we avoid acknowledging our own bad experiences with it. For example my Airport Extreme died while we were away Memorial Day. The Apple Store where I bought it couldn’t help me. Too bad for me. Its onla few years old. Why expect it to work? Related Link: MSFT=XIANS / APPL=JEWS. Listen. Buy. What do you do when you can’t get legally married where you live? Oh it’s just like the draft, except for the love part and the no killing part. And the h’ors d’oeuvres. It’s not exactly that flip. I grew up in Canada. my whole family lives in Toronto. We’ve decided to have the wedding-wedding here in San Francisco where our community a year from June. We originally though it might happen earlier. But between multiple surgeries and unrelated medical school it didn’t. But we want to be legally married as well. So we’re gong to do that in Toronto. Christmasi-sh-time, because that’s how school holidays are organized. With some family and people to celebrate because my family are Jews and they’re gonna shep naches whenever they can. You want to know why weddings are a big deal to Jews? Because it’s a legitimate occasion for happiness. Those don’t come often, so Jews have to cram all the happiness and tummelling they can whenever they get the chance. And I’m their oldest child and my mum has watched her friends have weddings so finally, she gets a chance. Let me tell you. If they wait long enough, it won’t matter that it’s a lesbian wedding. It’s a frickin’ wedding. Ladyporn. I’m thrilled that they’re thrilled. It was a 10 year journey with my mum to go from glum faces and anxiety attacks to “I want to make a wedding for you.” She came around before it became legal in Canada, but it sure helps. Stace’s folks haven’t had as long as mine to deal with this and they still live in a small town in the midwest. They’re not planning on inviting extended family or friends to either wedding. I imagine it’s weirder in some ways to be a parent of someone gay than to be gay yourself. I mean when I came out, I got to sleep with cute girls. What did my parents get out of it? Stylecouncil1‘s creativity takes Flickr to new places. 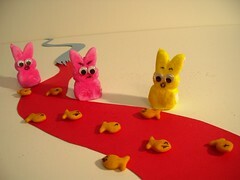 View the whole set of plagues ‘n peeps. Tip ‘o the toque to sra. As Solomon Schechter explained a century ago, “It is not the mere revealed Bible that is of first importance to the Jew, but the Bible as it repeats itself in history, in other words, as it is interpreted by tradition.” That is why the fact of Leviticus 18:22 in and of itself did not free the CJLS or any other Conservative Jew from the need to debate the matter of gay and lesbian ordination. The eminent historian Chancellor Gerson Cohen urged Conservative rabbis in 1972 to shape the movement in a way that was clearly and authentically Jewish but that would “also reflect our own formulation of Judaism, a formulation that will respond to our situation, our needs as Jews in America.” That need is once again clear and urgent. How shall we undertake to meet it? The proper way to do so, I believe, is not for JTS to promulgate a set of standards for Conservative belief and behavior. It is, rather, to engage Conservative Jews in discussion of what matters to them and why. Tip ‘o the shtrummel to sra. The conversation and distributed network is the paradigm of our times and of ancient tribal times too. It is the method for reonciling legal elements that are at odds. It is the way to split the gordian know. I’ve heard Reva Siegal, Yale Law Prof. suggest as much about the history of 14th amendment litigation. That viewed over time as a conversation it makes sense of the otherwise unreconcilable contradiction that there is no literal text in the US Constitution making women full citizens of the US although courts (generally) act as thought we are. My guess at the secreat behind all of this ? No way for Jews to keep musical theatre without the queers. Here’s an awesome mash-up: Avenue Jew (I would embed the video if WordPress didn’t make it so difficult to find my API key. Any geeks with ideas? ).